To keep industry abreast of continually changing legislation and best business practice, all of Landgate's Policy and Procedure guides are available for viewing online. If you would like to make suggestions for change or improvement to the guides available on this page, please complete and submit the Feedback form online, or send an email to guides@landgate.wa.gov.au. The information contained in the guides below is distributed by Landgate through the Landgate corporate website (www0.landgate.wa.gov.au/) as a guide or information source only. Various factors beyond the control of Landgate or the Landgate corporate website can affect the quality or accuracy of the information and products. While every effort has been made to ensure accuracy and completeness, no guarantee is given nor responsibility taken by Landgate or the Landgate corporate website for errors or omissions in the manual. Landgate and the Landgate corporate website do not accept any liability for any loss or damage incurred as a result of the use of, or reliance upon the information provided in this manual or incorporated into it by reference. The information in the guides below should not be regarded as legal advice. In all matters, users should seek legal advice from an independent legal practitioner. The Landgate corporate website provides links to other Internet sites. These external information sources are outside of Landgate’s control and it is the responsibility of Internet users to make their own decisions about the accuracy, reliability, suitability and correctness of information found. Copyright in the guides below is owned by the Western Australian Land Information Authority (Landgate) and is protected by the Copyright Act 1968 (Cwlth). * Commercialise any information, products or services obtained from any part of this Workbook, without Landgate’s prior written permission. Any authorised reproduction however altered, reformatted or redisplayed must acknowledge the source of the information and that Landgate is the owner of copyright. Crown for Plans prepared for the purposes of the Land Administration Act 1997. Plan Types. If the Plan is prepared for private purposes, then the Plan type is Freehold. The ‘Purpose’ panel on the Deposited Plan should record the purpose of the Plan. Only one purpose can be recorded per Plan (except for sole subject roads that require a Crown Land Title to be prepared– refer ‘Acquisition’ below). A Plan that will lead to the creation of new Titles (excluding the other ‘purpose’ categories below). Refer also to Plan Approval Requirements Sections 2 and 3. Except for land acquisitions under the LAA, road widenings that require a balance lot to be depicted on the Plan are to be regarded as having a purpose of ‘Subdivision’. Road widenings that automatically dedicate do not require a lot number. The taking of interests in land for public purposes (usually roads) under part 9 of the LAA requires a plan with a purpose of ‘acquisition’. See section 2 of Chapter 11 (Specific Plan Purposes) of the Survey and Plan Practice Manual. Where the sole purpose of a Plan is for the amalgamation of Crown Land with Freehold Land. See section 2 of Chapter 11 (Specific Plan Purposes) of the Survey and Plan Practice Manual. The Plan type must be shown as Freehold. Most roads will now be created on Plans of subdivision but where a road is being created within a large tract of Crown land it may still be possible to have a road as the sole subject of a Plan. The purpose of such a Plan is ‘Road’ except where there is a need to create a Crown Land Title for the road parcel – the Plan Purpose in these situations is ‘Acquisition (Road)’. This Plan Purpose is used when the only purpose of the Plan is to close a dedicated or private road. 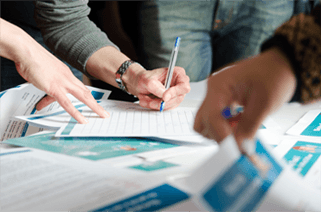 Where it is necessary for a section 152 of the P&D Act lot or lots to be the sole subject of a Plan, the Purpose of that Plan should be recorded as ‘Vesting in the Crown’. For Titles to be created an unambiguous ‘lot on Plan’ parcel identifier (PI) is required. There are many parcels in the current system that do not meet this basic requirement and to allow Titles to be created for those parcels Conversion Plans need to be prepared. For example, balance lots created by subdivisions (not road widenings) and lots created by sketches on transfer will require Conversion Plans. Due to the high volume of Conversion Plans prepared by Landgate for SmartRegister purposes such plans may not necessarily always meet the normal drafting standards. As a minimum, Conversion Plans prepared by Landgate will match the standard of the paper title sketches. Landgate no longer prepares such plans. Plans with a Purpose of ‘Conversion’ are also required for applications to bring land under the TLA. the condition of the original graphic has deteriorated. plans associated with applications under sections 159 (see Survey Guidelines Section 16) and 170 (see Surveys of Water Boundaries Section 7) of the TLA. Simple ‘bore’ easements between neighbours. The ‘Interest’ purpose is only to be recorded when an interest or interests is the only subject of a Crown or Freehold Plan. To facilitate actions under various statutes in reference to particular areas of land. They do not affect tenure but impose conditions or lift constraints on the subject of the Plan. For ‘Notices of Intention to Take’. For administrative boundaries and these boundaries can be of a temporary nature exempting an area for 1 day from restrictions under law that would not allow the proposed activities to take place. Examples of a more permanent nature include definitions of Port Authority areas, custom areas, off-road vehicle areas, shire and rating area. Where the nature of the administrative process does not justify the expense of survey and marking. A description of all new tenure created by a Deposited Plan is to be shown in the heading panel labelled ‘PLAN OF’. If new lots, roads, easements or covenants are being created they must be included in the heading. Note: New interests and notifications being created by document only are NOT shown in the heading. Existing interests being brought forward are not to be included in the heading. See plan example 51. The local government and locality of the land under survey is to be shown. Where the subject land is only one parcel involving only one Title then, in the space labelled ‘Former Tenure’ in the Plan Title block, show the former tenure in a ‘lot on Plan’ format together with the Certificate of Title volume and folio number. 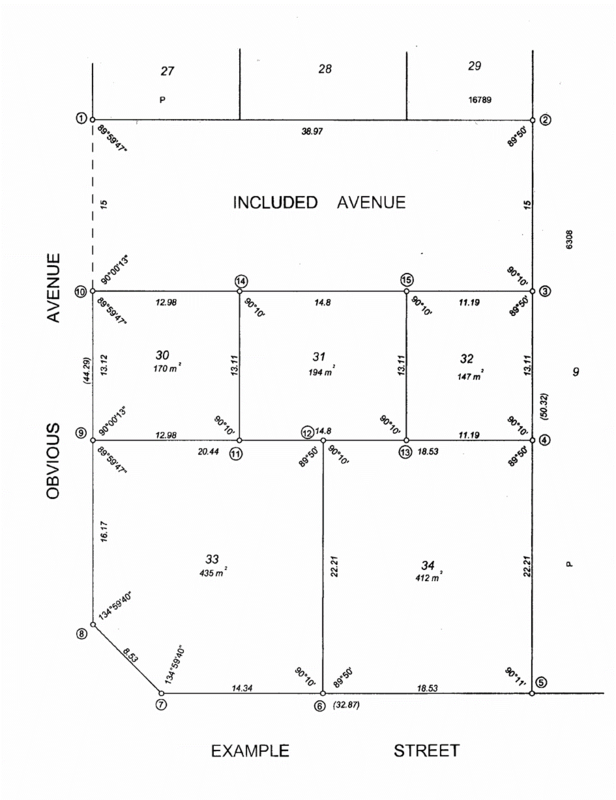 Plans involving more than one parent lot or Title are to include a table (see Table 10.1 below and plan example 1) showing all the new land parcels created together with the respective former tenure for those lots, the parent survey plan and the relevant Certificate of Title volume and folio numbers (a requirement for searching Landgate’s image system). Where a subdivision involves land in a Plan for which a Title has not been issued as yet, the Former Tenure Table should see the previous lot/s on Plan only. The ‘Title’ column in the table is to be left blank. To allow most of the existing lots described as part lots (as a result of road excisions, etc.) to be captured as digital titles it was necessary for them to be captured as whole lot Titles endorsed with an exclusion notation (e.g. ‘excludes road shown on CP1234’). These same lots were also converted en masse in the spatial database to be shown as whole lots. New Deposited Plans should show these lots (ie. former part lots that have been captured as whole lots) as whole lots in the former tenure box/table. Those part lots that have not been, or could not be captured should be shown as ‘Pt’ lots in the former tenure table. Surveyors encountering dual numbered Plans must only use the new Deposited Plan number in the Former Tenure Box or Table. See Searching Landgate Records Section 5. The ‘FIELD RECORDS’ section contains the field record numbers that are relevant to the survey that defines the subject land. In the case of a compiled plan then the notation ‘COMPILED’ should be used instead of the FB number. For Special Survey Areas the field records listed in this section of the title block should be the ‘re-establishment and control’ field books for the subdivision. For subdivisions within SSAs, it is not necessary to include a field record if the survey has been carried out using only existing permanent marks within the SSA. The surveyor must ensure the Surveyor's Certificate (Reg 54 or Compiled) is signed on all Deposited Plans. The responsibility for the entirety of the plan resides with the signing Licensed Surveyor (see Notice to Surveyors 01/2007- from the Land Surveyors Licensing Board). Surveyors are to show Survey Firm information (telephone number and email address). This will assist Landgate in any contact required with the Surveyor or firm and ensure that In Order for Dealings Copies of Deposited Plans are returned to correct firms. The processes for ‘Plan In Order For Dealings’ and ‘APPROVED’ are the same for both Crown and Freehold Plans. When a Plan is made ‘In Order For Dealings’ a list of all actions necessary for Titles to issue is inserted in that panel by the Plan Examiner. The annotation ‘Reg 26A’ or ‘Reg 21(1)’ shall be shown within the ‘Approved’ panel if the Plan is subject to those particular regulations. ‘Reg 26A’ refers to special surveys carried out under general regulation 26A. ‘Reg 21(1)’ refers to special Crown surveys carried out under regulation 21 of the Land Administration Regulations 1998. The ‘total area’ for Crown surveys is to be shown within the graphic area of the new Plan form. Easements, Covenants, Notifications and Other Interests covers the practices related to the presentation of both Crown and Freehold easements. Surveyors are advised that plans of subdivisions subject to a proposed reserve under section 152 of the P&D Act must depict the purpose on the plan exactly as described in the WAPC condition for subdivisional approval. Any clarification or interpretation of a vesting purpose is to be referred to the WAPC. Also see Appendix 8. Section 167 P & D Act Easements (old section 27A of the TP&D Act) are the only accepted interests over vesting land. Easements in gross to private companies - e.g. Wang/Parmelia - gas pipelines, restrictive covenants caveats and mortgages are unacceptable and must be removed. Where Planning conditions require lots to be transferred to the Crown for purposes other than those covered under section 152 a notation is to be shown in the Interests & Notifications table on the plan stating LOT... TO BE TRANSFERRED TO THE CROWN... for a specific purpose. This notation should be placed in the comments column of the ‘Schedule of Interests and Notifications’ (refer). Easements, Covenants, Notifications and Other Interests Section 14deals with easements and covenants over vesting land. The bringing forward of original Crown allotment boundaries onto Freehold Plans is not required unless a depth limitation in the original Crown Grant (see General Drafting Practices Section 45) or some other spatial element affecting the parent Title (e.g. a notification) needs to be identified. 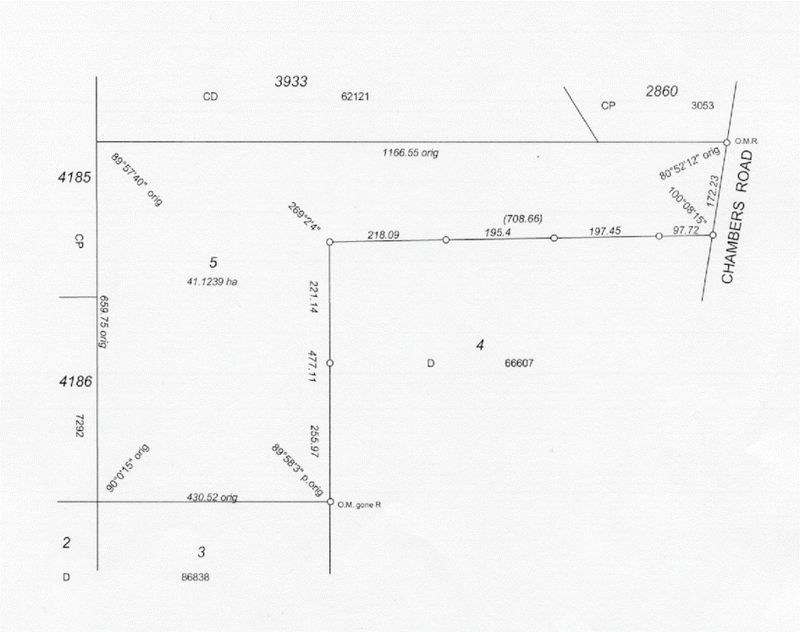 Where a depth limit from a Crown Grant applies to only part of a new Freehold lot the extent of the original Crown allotment that forms part or the whole of the subject of the Plan must be shown. If all the subject land for a Plan has the same depth limitation the original Crown allotment boundaries need not be shown. On plan example 7, Nelson Location 4495 has a depth limit of 60.96 metres and its extent relative to that Plan is shown in the normal manner. The original Crown boundaries for Location 3880 are not shown (except where it abuts Location 4495) because it has no depth limit. CALCULATED DIMENSIONS DERIVED IN ACCORDANCE WITH SURVEY REGISTRATION MINUTE 1/98. EASEMENT CASEMENT CALCULATED FROM CENTRELINE TRAVERSE. Where special conditions for survey exist a notation shall be shown to indicate these conditions. An appropriate alternative notation can be used for any other unique circumstance, the notation ‘Reg 26A’ or ‘Reg21(1)’ is to be shown in the approval panel of the Title Block. A replacement Plan, with version control, is required for any amendment to a Plan. Amendments include any changes to the Plan instigated by the surveyor or Landgate Examination Requirements. Also a new CSD File is required with replacement Plans where the surveyor has amended lot boundaries or added / amended Easement details. Replacement of hardcopy Deposited Plans is to be a digital version. Any amendments to Plans lodged prior to the introduction of Deposited Plans require cancellation of the superseded Plan and lodgement of a new digital Deposited Plan. Landgate will not carry out any amendments to Plans. Refer to Transfer of Land Regulations 2004. Version- 2 (History of versions not required). Amendment- statement to be “Examination Requirements”. Authorised By- the name of the surveyor only is required (signature not required)- name of firm or drafting contractor not required. The schedule below sets out the policy of the Commissioner of Titles on Plan amendments after they have been approved by the Inspector of Plans and Surveys or an Authorised Land Officer. Correction of Angles- Authority to amend governed by the effect of the extent of correction on areas or boundary lengths (see 1 above). Formal ‘Direction to Amend’ by the Deputy/Commissioner of Titles is required for amendments to easements, covenants and notifications etc. shown on a plan/diagram. This schedule does not deal with corrections to graphics on paper Certificates of Title that may be necessary after correction of the relevant Plan. Cancellation of Crown Plans is under the direction of DPLH/Lands and certified accordingly by an ALO. Type B - if a surveyor carries out a subdivision and the land being subdivided is the subject of a Plan that has not been dealt on, then this superseded Plan must either be dealt on or cancelled. If the cancellation option is chosen, the Surveyor’s Report can be used to request cancellation of the redundant Plan. It should be noted that if a surveyor is aware that the land to be subdivided is to be the subject of a cancellation the Former Tenure Table should not reflect details of the Plan to be cancelled. For Type A cancellations, any authority that has an interest that would have been automatically created on plan approval has to provide consent to the cancellation. This does not include the automatic creation of roads or road widenings. On receipt of a cancellation request, the Plan is prepared for cancellation, is cancelled by the Inspector of Plans and Surveys and SmartPlan is updated to show a status of ‘Cancelled’. All relevant authorities are notified of the cancellation if the Plan has been endorsed by WAPC. A fee is charged by Landgate for the cancellation of a Plan and payment is required before the plan will be cancelled. Landgate will send an account and a copy of the Plan showing cancellation to the person who requested the cancellation. Note: Plans cannot be cancelled once Dealings have been accepted. Digital Data is an electronic record of a survey. Regulation 3 of the Transfer of Land (Surveys) Regulation 1995 requires that Digital Data must accompany every survey plan and survey-strata plan lodged in Landgate. The data must be supplied in the format specified by the Inspector of Plans and Surveys. Such digital information is to be regarded as being part of the Plan for the purpose of certification by the surveyor under the general regulations. 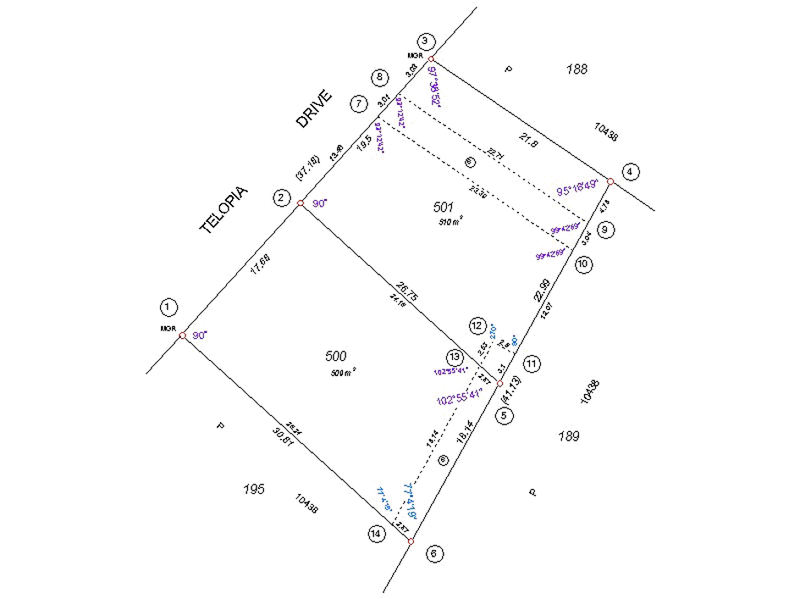 Cadastral Survey Data (CSD) file format version 2.0 is the specified standard for format of digital data. Refer to the Cadastral Survey Data (CSD) User Guide (Survey and Plans Practice Manual Appendix 5) to assist in the compiling of (CSD) files. All polygons on the Plan including Surrounds, Easements and portion only Covenants and Notifications burdening and benefiting land within the Plan are to be included in the file (A surround polygon is required for a one lot plan). 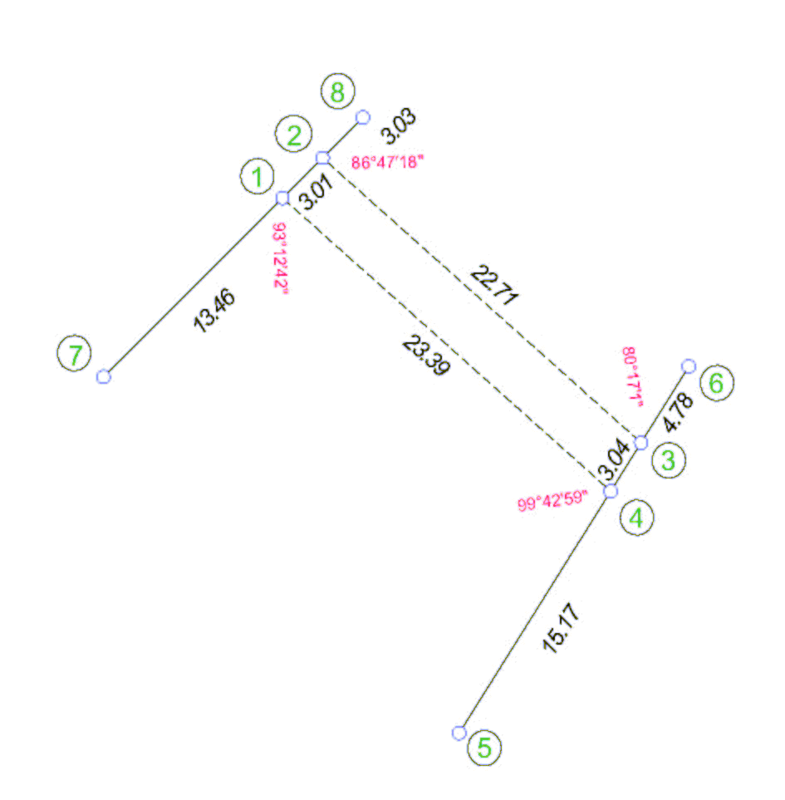 If the subject of the survey is split into 3 sections then 3 surround polygons are required. To ensure roads are depicted correctly in Landgate’s spatial systems, road polygons must be created in CSD files to the full extent of each road name (including truncations) that appears on the Plan. Roads are to be captured in segments in the digital file; as determined by the connections across the roads shown on the plan. Each segment must have the correct road name and be fully dimensioned with angles and distances. Road names must not be abbreviated (e.g. Use ‘John Street’ not ‘John St’). This also applies to the road names in the street addresses attached to lots in the CSD files. All the distances and angles on Plans, including those that define interests (e.g. easements) or subject to Executive/Survey Registration Minutes, are to be shown as ‘measured’ and to be given attributes of ‘surveyed measured’ for distances and ‘measured’ for angles in the CSD file; even if the field record shows them as calculated from offsets or radiations. That is, the ‘measured’ attribute is to be used for all boundary dimensions on a plan regardless of whether it is directly measured, derived from eccentric measurements or calculated from missing element solutions eg lost corner restoration. The above also applies to eFB_CSD files complementing SSA Survey Sheets. Lot areas in CSD file to be same as Plan and field record. changes to dimensions, angles etc. Three dimensional polygons do not currently require a vertical component to be captured. All Easement and portion only Covenant and Notification polygons burdening and benefiting land within cadastral lots depicted on a new Deposited Plan are to be captured in a CSD file using the polygon type ‘Easement’ or ‘Easement or Interest’ or ‘Interest’ depending on the version of the application used to create the CSD file. Easement points (e.g. points 7 to 14 inclusive, 13.8.14 in Figure 16-3) must now be intersected on cadastral boundaries when capturing the surround and lots (e.g. lots 500 & 501 on the sketch). The easement points for any new or existing easement must have attributes of ‘surveyed’ and have ‘Point Codes’ (i.e. ‘pnthormethod’ attribute) ‘T’, Traverse Adjustment, in the point records. The lines of all easement polygons (old or new) are to have attributes of ‘surveyed’ and have ‘Line Codes’ (i.e. ‘distderiv’ attribute) ‘M’, Measured. ’R’, Cadastral Road – where the easement line coincides with a road boundary (e.g. line 7-8 on the sketch). 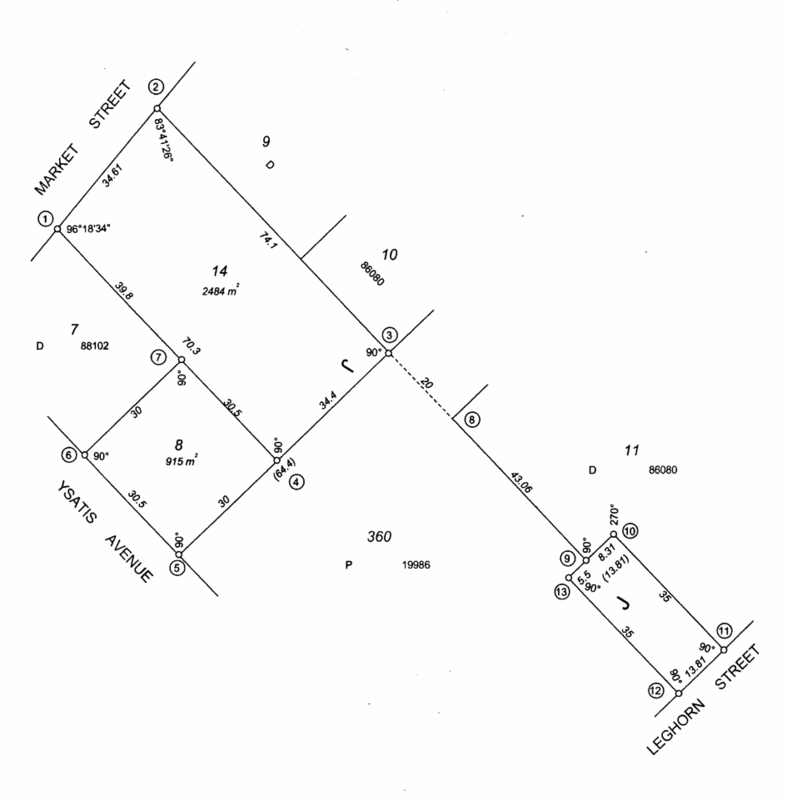 ‘I’, Cadastral Internal – where the easement line coincides with an internal cadastral boundary (e.g. lines 9-10, 11-5, 5-6, 13-5 & 14-6 on the sketch). 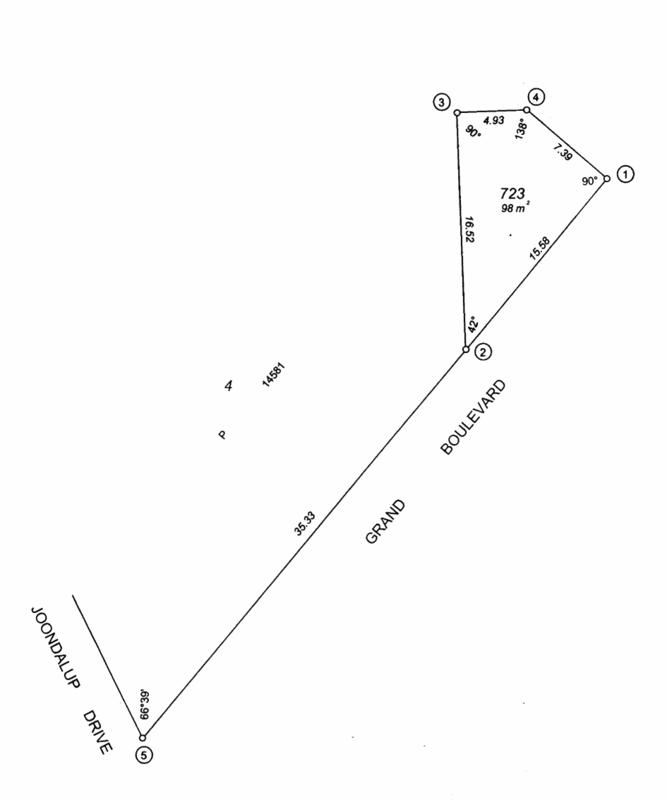 ‘E’, Easement – where the easement line does not coincide with a cadastral boundary (e.g. line 14-13, 13-12, 12-11, 8-9 & 10-7 on the sketch). The ‘Angle Codes’ (i.e. the ‘angderiv’ attributes) for angles of all easement polygons (old or new) are to have attributes of ‘measured’. Where Deposited Plans are amended following lodgement at Landgate by the addition or deletion of easements, Landgate Officers will apply discretion on whether a replacement CSD file from the surveyor is required. Figure 16.4 below illustrates the requirements. The connections 2-8 and 3-6 as well as 1-7 and 4-5 are required. Split surround polygons are to be captured as separate polygons linked by a traverse, both being labelled surround and are to be captured as separate polygons using same lot number, except when real world coordinates are used. Surround using points 1 to 7 inclusive. Traverse in points 3, 8 & 9 (to create a link to the separate polygon). Surround using points 9 to 13 inclusive. Lot 14 using points 1, 2, 3, 4 & 7. Lot 8 using points 4, 5, 6 & 7. Lot 14 using points 9 to 13 inclusive. This allows accurate positioning of the survey. Surround using points 1 to 4 inclusive. Lot 723 using points 1 to 4 inclusive. Where a water boundary is not being defined by survey and it is the lot boundary the Topographic string is not required. Only show a construct line with angles, joining the end points and amend the area to agree with the Plan (being balance area of C/T). Manual lodgement of Deposited Plans is no longer acceptable. All Deposited Plans must now be lodged electronically. Appendix 6 (APX-06) provides guidelines on the preparation and lodgement of electronic plans. From 1 June 2010, after a successful trial period, Landgate has allowed the lodgement of Deposited Plans and Strata/Survey – Strata Plans using the Lot Synchronisation (Lot Sync) process. Lot Sync reduces the processing time for the issue of new Certificates of Title. This is achieved by using earlier lodgement of registration documents, parallel processing and different timing points when examining the Plan and examining the documents. To provide an opportunity for all developers, Landgate is also including into the process Plans not requiring Western Australian Planning Commission (WAPC) endorsement. Lot Sync has been initiated by Landgate as part of its commitment to improve the supply and availability of land to market. It is intended to align Landgate with other agencies, utilities and stakeholders with regard to the registration of new lots. 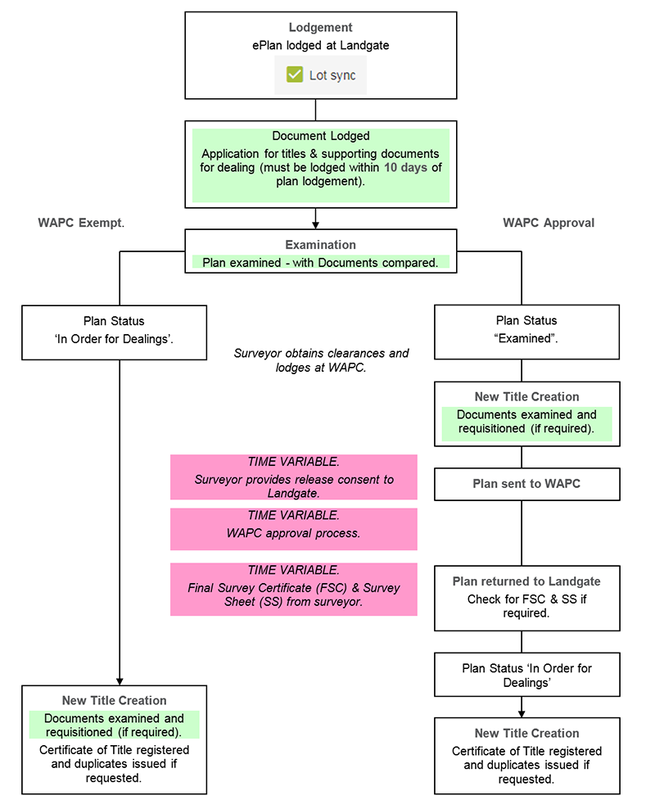 Using the Lot Sync process to lodge a Plan ensures Certificates of Title will be issued as close as possible to the WAPC endorsement date for the plan of subdivision. Lot Sync is voluntary and is intended as an alternative method for parties to lodge Plans and documents; it does not replace the current lodgement process. Lot Sync is only applicable in cases where the documents are lodged before the plan is ‘In Order for Dealings’. When lodging Plans using Lot Sync, all registration documents (except for the production of the duplicate certificate of title) must be lodged within 10 working days after the Plan is lodged. The duplicate certificate of title must be produced prior to the Plan being placed ‘In Order for Dealings’. If there is any non-compliance with the rules the Plan will not be examined using Lot Sync and the documents will not be examined until the Plan is ‘In Order for Dealings’. For Strata Plans, all relevant and available forms must also be submitted at Plan lodgement. All required registration documents, including the Application for Title, to complete the issue of titles by the Registrar must be lodged at Landgate within 10 working days of the Plan lodgement. The normal lodgement fees for both Plans and registration documents will be applied. Any Plan and registration document errors will be subject to the regulated requisition fees. I ……………………………………… am the (Solicitor/Settlement Agent) for the applicant. I have authority to make and to authorise on behalf of such persons the following amendment. I acknowledge that the registration date for the documents necessary to issue Certificates of Title and any following documents for DP ………………….. will be altered to concur with the yet to be established ‘In Order for Dealings’ date of the said Deposited Plan. ePlans prepared in accordance with the guidelines at Appendix 6 (APX-06) must be lodged in NLR-P.
Surveyors must lodge field records at Landgate electronically in NLR-P in accordance with the guidelines at Appendix 6 (APX-06). Surveyors are advised that Deposited Plans lodged with Landgate that require a field book will not be examined until the field book has also been lodged. Plans without the necessary field book(s) will lose priority and be given a status of “Stopped”. Where a Plan is not lodged within two years from the time of ground marking then a ‘Two Year Certificate’ is required (see regulation 53A of the Licensed Surveyors (General Surveying Practice) Regulations 1961) to certify that the survey has been inspected and that all marks have been verified. The letter should be addressed to the Inspector of Plans and Surveys and accompany the Plan when it is lodged. Where a certifying surveyor is not eligible to verify Plans, the Plans must be countersigned by an ‘Eligible Surveyor’ before they can be lodged. The Certificate to be shown on the Plan is included at Plan Practices Section 12. See plan example 49. The flowchart below (Figure 1) details the Crown Survey/Drafting contract process from the planning stage through the issue of the contract, lodgement, registration and the examination/validation process. The survey/drafting contract is issued giving instructions as to the locality of, and the requirements for survey, as well as details for graphic presentation. Another form listing ‘Crown Drafting requirements’ and ‘Additional Notes’ is also provided with the instructions. Surveyors are requested to notify the Central Issuing Office (Survey Coordination), Land Use Management, Department of Planning, Lands and Heritage, if they are unable to comply with the completion date shown on the Face Sheet. A Plan Approval Requirements Sheet/Ministerial Order Sheet will be issued with each contract. This sheet will list consents required for the removal of constraints to Plan approval along with Ministerial Orders for the disposal of subject lands. Any subsequent contact with Landgate, with regard to further direction for the survey or preparation of the graphic, should be the subject of the surveyor’s report, detailed on the Survey/Drafting Instructions. Surveyors should address any land management issues affecting the survey and consult with Central Issuing Office (Survey Coordination), Land Use Management, Department of Planning, Lands and Heritage, if necessary. 5. Field book, plan, digital data, survey report form, Surveyor’s self-assessment lodgement form, survey information and account lodged with CIO, DPLH. Electronic field books (EFB) to be lodged directly with Landgate. See Appendix 6. 6. Sends copy of lodgement receipt and clearances to WAPC. Any other relevant data and its source e.g. Geographic Names. Upon lodgement, the survey information must comprise a clearly indexed copy of the SIP along with sequential copies of Plans and field notes. This search is essential for the examination/validation process and poor quality information may be subject to a requisition. Survey information will be returned if requested. On completion of a Crown survey/drafting contract, the surveyor (or agent) presents the following to the Survey Coordinator, CIO, State Land Services. Field book (Electronic Field Books lodged directly with Landgate). Survey Plan (ePlan for lodging at Landgate). Digital Data - separate file for each Plan with the file name noted in pencil on the Plan, in CSD format on a CD-ROM. Account or copy of account (as applicable). Verifies surveyor’s certification of the Plan and field book and Eligible Licensed Surveyor certification, if applicable. Lodges the field book with Landgate. Forwards the contract ‘case’ to Landgate for Plan lodgement and examination/validation. Pays plan lodgement fee. See General Drafting Practices Section 43. The Land Surveyors Licensing Board has approved guidelines for surveys and Plans for all new developments involving more than 10 serviced lots where new roads are created. The Guidelines are referred to as Survey Practice Guidelines for Subdivisions within Special Survey Areas (SSA guidelines). These Guidelines apply to Crown, Freehold and Survey-Strata developments and can be accessed on the Board website at http://www.lslb.wa.gov.au. There are two different processes of land development that can be used for Crown and Freehold subdivisions. One is known as the ‘Special Survey Area’ (SSA) process and the other is known as the ’Normal’ process. The SSA process allows for a Plan based on calculated dimensions to be lodged at Landgate before any lot corners have been marked. The Normal process requires full marking (including referencing in accordance with the regulations) of the survey prior to lodgement of the Plan at Landgate. The normal process would usually be used only for small urban developments and rural subdivisions. Where marks are likely to be destroyed by site works, road construction or servicing the SSA process should be used. Landgate will not accept Plans based on calculated dimensions unless the SSA guidelines have been complied with or approval for a special survey from the Inspector of Plans and Surveys or an authorised land officer. Table 20.1: Comparison between the SSA Process and the Normal Process. * Regulation 26A approval from the IPS for limited or deferred marking/referencing required before Plan lodged at Landgate. **Where the Deferred Final Marking option is used then Plan sent to WAPC on release consent and Plan placed IOFD following WAPC approval and receipt of ISC. Refer to the appropriate Plan examples in Appendix 4 to indicate what information is to be depicted on such Plans. Subdivision and development of Crown land under section 27 of the LAA. Reservation of land parcels under section 41 of the LAA. Management, leasing, etc. of reserves under section 46 of the LAA. Redescription/Cancellation of ‘A’ Class reserves (excluding Conservation Parks, National Parks and ‘A’ Class nature reserves) via a Ministerial Order. Conservation Parks, National Parks and ‘A’ Class nature reserves still require a Reserves Bill. Redescription/Cancellation of other than ‘A’ Class reserves under section 51 of the LAA. Amendment of townsite boundary under section 26 of the LAA. Revestment of land - Freehold land acquired by the Crown, whether by transfer or acquisition (taking) or pursuant to other provisions such as those in the Local Government Act 1995 relating to forfeiture of land for non-payment of rates may be revested in the Crown under section 82 of the LAA (see section 243 of the TLA also). If the previous tenure is Unallocated Crown Land (UCL) no Crown Land Title (CLT) would exist for the subject land. If the previous tenure of the subject land has a PI (parcel identifier), a Title will have been created. Land that is to be transferred and revested from a Crown Grant in Trust or any other Freehold land cannot be amalgamated with adjoining Crown land under a single PI unless the status of the two parcels of land is the same. Revested Freehold land automatically assumes the status of a CLT, therefore the adjoining Crown land to attain CLT status must undergo a process where all the interests are declared by way of a Statutory Declaration by the controlling authority and any other interest holders. See also Specific Plan Purpose Section 11for a specific type of crown subdivision. Regulation 5 of the Transfer of Land (Surveys) Regulations 1995 requires surveyors to include in Plans of subdivision, acquisition and amalgamation (this includes amalgamations of Crown land with Freehold land) any residue land from the original certificate of title as a separate balance lot or lots. (See General Drafting Practices Section 15.) Where a road has an existing lot number and a portion is to be closed, a balance lot must be created showing any existing interests carried forward. The heading is to include ‘and Dedicated Roads (Lot 300)’. If the boundaries of the residue are extensive the Registrar of Titles, Inspector of Plans and Surveys or an Authorised Land Officer may allow the part of the Plan showing the residue to be compiled and the distances, angles or bearings (where applicable) for the boundaries, easements or covenants to be omitted. Surveyors will need to consult with the developer (or project manager) to ensure the balance lot or lots are consistent with the proposed land release strategies.. Where a series of Plans are lodged simultaneously, the first Plan should show balance lots that contain the land included in subsequent Plans. The ‘Former Tenure Table’ on the subsequent Plans would refer to the lots being created on the first Plan. To avoid planning and valuation problems, surveyors must identify any balance lots that are not to receive servicing facilities with a lot number in the 9000 number range. Any “super lots” that are the subject of future stages in the subdivision can be identified using the 9500 number series. If an existing Certificate of Title contains multiple lots and only one of the lots is being subdivided it is necessary for the new Plan of subdivision to show all the land in the Title. It may suit some developments to separate the lots into several titles, including new multi-lot titles, prior to subdivision. Where there is a high level of activity in large urban subdivisions, Landgate experiences difficulties with downstream processes such as Electronic Advice of Sale where numerous stages of subdivisions are being dealt on simultaneously. To avoid these problems occurring and any potential delays in Titles being issued surveyors should, where they are aware that stages of a subdivision are likely to be dealt on (ie. applications for new Titles made) simultaneously, consider merging the stages into a single Deposited Plan prior to lodging at Landgate. It would also be helpful if surveyors could minimise the Plan surrounds of large subdivisions by creating manageable and logical balance lots by using ‘super lots’ for proposed stages. This would result in reduced Plan sizes and examination timeframes and therefore provide quicker processing of these developments. Where a Plan for a stage in a subdivision is delayed and a Plan that was intended to be a subsequent stage is to be dealt on first, subject to WAPC approval, the Deposited Plans may be replaced to allow the dealings to proceed. Replacement plans will often involve changing the Plan heading, the balance lot details and the former tenure information. New CSD files for the Plans are also required, and the statutory fees for replacement plans apply. New subdivisions must comprise all of the land in the parent Certificate of Title and not leave any residue or part lots. (Refer Plan Approval Requirement section 4.) Upon lodgement of an application for new Certificates of Title the subject of a DP, a new Title will also automatically be created for the balance lot, along with the other lots on the DP. There were many existing paper (manual) Titles that did not refer directly to a whole lot on a Plan and as such Landgate undertook a progressive capture of the graphics for those Titles. Many of these have be reflected on a ‘Conversion’ Deposited Plan. Landgate no longer creates such conversion plans. A conversion Deposited Plan certified by a licensed surveyor reflecting the balance of the land as a whole new lot. Interests to be brought forward onto the Plan. CSD file to be lodged with the Plan. There is no requirement for WAPC approval and no Landgate plan lodgement fee will apply. The repealing of regulation 44 of the Licensed Surveyors (Transfer of Land Act 1893) Regulations 1961 has allowed for Plans to show land in multiple ownership without the need for conveyancing action to bring the land into single ownership. Plans involving multiple owners will require all the relevant transfer documents and consents pertaining to encumbrances to be lodged before the Plan is approved. New Titles will be issued in accordance with a single application (signed by all the affected owners). The Transfer of Land Act 1893 allows for disposition statements to enable clarity in the allocation of encumbrances in land transfers. See General Drafting Practices Section 17. See section 2 of Chapter 11 (Specific Plan Purposes) of the Survey and Plan Practice Manual. The Registrar of Titles or an Authorised Land Officer may authorise for an isolated Crown parcel to be shown on a Plan without the residue land (see General Drafting Practices Section 15) being shown on the Plan. Plans of isolated parcels that are not connected to the State Geodetic Network must show bearings and an azimuth source. See General Drafting Practices Section 29 and plan example 65. In urban areas, lot numbers are often used as the street addresses during house construction so the surveyor should avoid duplication of lot numbers in the same street within the same suburb. 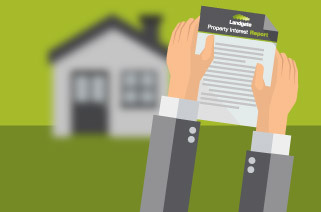 Problems arise where there are inconsistencies between Deposited Plans and documents subsequently lodged for easements and covenants under Part IVA of the Transfer of Land Act 1893. Surveyors need to consult closely with their clients’ solicitor/conveyancer to ensure that the depiction of easements and covenants on Plans is consistent with the supporting documents that are to be lodged. See Easements, Covenants, Notifications and Other Interests Section 27. Occasionally surveyors lodge field records for surveys of subdivisions that for some reason do not proceed and no Plan is ever lodged at Landgate. In this situation, the field record would never get cross-indexed onto the Survey Index Plan without manual intervention. If the index page of the field book indicates a ‘Subdivision’ is proposed Landgate will expect a Plan to follow the field book to trigger the cross-indexing. If this situation arises (or has even occurred in the past) surveyors should contact Survey Inspection at Landgate on +61 (0)8 9273 7423 and request the field record be cross-indexed onto the SIP View. If for some reason a subdivision does not proceed and a field book has been prepared, surveyors are encouraged to still lodge the book at Landgate but strike through the word ‘Subdivision’ and add the words ‘Spike Protection’ or ‘Repeg’. This will ensure the field book is cross-indexed in this instance. Western Australia has several high pressure gas transmission pipelines servicing the metropolitan area and south west of the State. The pipelines have separate and different legislative requirements that will affect the production of Plans of subdivision lodged at Landgate. The DBNGP corridor was established after the sale of the pipeline in 1998 and incorporated most of the previous gas pipeline easements held in the name of SECWA, Alinta Gas or the Gas Corporation. The Dampier to Bunbury Pipeline Act 1997 regulates the use of land within the DBNGP corridor and is relatively restrictive in its requirements. The Infrastructure Corridors section in the Department of Planning, Lands and Heritage (DPLH) manages the DBNGP corridor and has, with Ministerial endorsement, established a policy of not creating additional easements or interests over land in the corridor. In terms of Plan production, this means it is highly unlikely a Plan presented showing an easement over the DBNGP corridor would be approved or any subsequent endorsement on the Title registered. Plans that impact on the DBNGP corridor land should show a gap in the easement, or right of carriageway, where they cross the DBNGP corridor. To facilitate legal access to that portion of land held in the DBNGP corridor the consent of the Minister is usually required. For further information on the requirements in relation to access, easements or the creation of interests in the DBNGP corridor, contact should be made with the Infrastructure Corridors section at DPLH via e-mail: infrastructure.corridors@lands.wa.gov.au. The Parmelia Pipeline (Formerly the WANG or Dongara to Pinjarra Pipeline) is a privately owned gas transmission pipeline. Its current owners, APA, operate the pipeline within an easement registered on the applicable Titles. It is therefore important that when preparing Plans of subdivision that have roads going over the pipeline easement, the effect of which would be to extinguish the easement, that early contact be made with APA to provide for future secure tenure for the gas pipeline and/or associated facilities as a replacement for the easement. For further information, please contact APA directly (See https://www.apa.com.au/contact). This user guide is intended as an aid for surveyors when creating CSD files for lodgement with Landgate. These Guidelines are issued by the Inspector of Plans and Surveys and for the purposes of Regulation 5 of the Licensed Surveyors (Transfer of Land Act 1893) Regulations 1961 they are to be regarded as ‘special directions’. The Land Surveyors Licensing Board and executive members of the survey industry have been consulted in the preparation of these guidelines and for the purposes of Regulation 10 of the Transfer of Land (Surveys) Regulations 1995 they have been approved by the Registrar of Titles. These Guidelines specify the approved practices for lodging Deposited/Survey-Strata/Strata Plans (Plans) and Field Records electronically at Landgate. For the purposes of these Guidelines Plans lodged electronically are referred to as ePlans. Electronic lodgement is compulsory for all field records, Deposited, Survey-Strata and Strata Plans. Surveyors must have access to Adobe Acrobat or other suitable software to digitally certify ePlans and be registered with Landgate as a surveyor approved to lodge Plans electronically. To become registered, the surveyor’s ‘User Certificate’ must be exported and forwarded to Landgate as a P7C file via email addressed to PlanReg@landgate.wa.gov.au. Landgate will use this certificate to verify the digital signature on the Plans signed by that surveyor. Landgate will contact the surveyor in the first instance to confirm the Certificate details. Surveyors must obtain a pre-allocated Plan number prior to lodgement (refer to Chapter 9.2 of the Survey and Plan practice manual). The Plan number must be shown on the Plan in the position designated on the Plan form. Plans lodged electronically to Landgate must be in a vector and text based Portable Document Format (PDF) file. PDF files based on images are not acceptable. Multi-sheet plans are to be included in a single PDF file with the sheets in numerical order. All sheets are to be orientated upright in landscape view. The standard of drafting must comply with the requirements within the Survey and Plan Practice Manual. ePlans must be accompanied by a CSD file in accordance with Landgate’s requirements. The surveyor must digitally sign the Regulation 54 certificate or the ‘Compiled’ certificate using Adobe Acrobat ‘Self Sign Security’ prior to lodging an ePlan. The digital signature should include a scanned image of the surveyor’s usual signature. For multi-sheet ePlans, each sheet, including SSA survey sheets, must contain the surveyor’s digital signature. The procedure for digitally signing a multi-sheet ePlan will vary depending on the version of Adobe Acrobat used. Surveyors must retain a backup copy of their digital signature profile file and must be able to recall the password used to create the profile. Surveyors must ensure adequate measures are taken to protect the security of their digital signatures. All ePlans and Field Records are to be lodged in NLR-Plan as accessed from My Landgate Survey Channel. The subject line must include each of the purposes where more than one purpose is relevant eg additional and urgent request. Surveyors must obtain a pre-allocated field record number from Landgate prior to lodgement (refer to Chapter 9.2). This number must be shown on the first page of the field record. Field records lodged electronically to Landgate must be in an A4 page size Portable Document Format (PDF) file that is of a high standard of legibility. Vector graphics or text (converted to PDF) may be included. Landgate will reject a field record if the image quality is not of an adequate standard for clear legibility or the page sizes do not match with A4. Multi-page field records are to be included in a single PDF file with the pages in numerical order. All pages are to be orientated upright in landscape view. PDF files must not be encrypted at the time of lodgement. Surveyors may include any relevant information in a field record that describes the survey. Pages created in CAD applications, pages or tables created in word processing or spreadsheets applications can all be converted to PDF and included where appropriate provided the pages do not exceed A4 size. The PDF file must not exceed 10MB. Field records lodged electronically to Landgate must have the regulation 17(1) certificate signed by the surveyor as part of the scanned image or as a digital certificate in the PDF file. The digital signature should include a scanned image of the surveyor’s usual signature. Field records must be lodged electronically via NLR-P. The filename is to include the prefix “fb” (in lowercase) followed by the pre-allocated field record number and then the “.pdf” extension e.g. fb90000.pdf. The Electronic Transactions Act 2003 (the Act) has strict requirements concerning the retention of records, especially for the ‘First Party’ to a transaction. Surveyors who lodge ePlans must ensure that they retain their copies of the documents such that they can be readily retrieved if necessary. Surveyors should also retain copies of any email/s related to the lodgement of ePlans. The Act allows for these records to be retained in electronic form if desired. To assist in identifying all the interests on a Plan, surveyors are to show the details in a ‘schedule of interests and notifications’. The schedule is to contain one or both types of dividing lines: the “full line” and the “dotted line”. All interests and notifications being brought forward are to be listed in chronological order on registration date above ‘the full line’. All new interests and notifications are to be shown below ‘the full line’ and above the ‘dotted line’ together with any interests being modified. All new vestings and notifications are to be listed chronologically below the dotted line. Please note that the dotted lines in each table are there to help you distinguish between the different Interests and Notifications and are not intended to be on Plans. The contents of the Practice Manual below will be incrementally migrated into the above Policy and Procedure Guides.